Looking to sync Newsletter subscriber's to ActiveCampaign? With Revenue Conduit, you can keep track of all customers in ActiveCampaign who initially said that they "Accept Marketing" during your checkout process. By default, most shopping cart setups have a checkbox of some type during checkout to specify whether they accept future marketing. You might have the checkbox phrased in terms of, "Subscribe to Our Newsletter", or something like that. 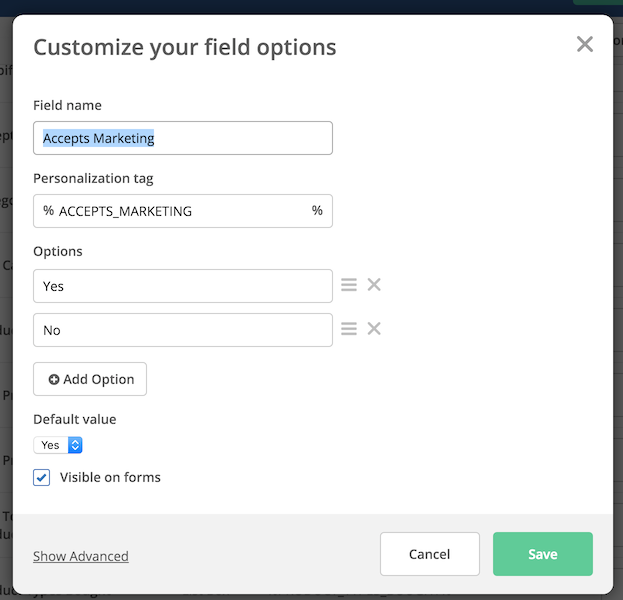 Revenue Conduit automatically generates an ActiveCampaign Field called Accepts Marketing as a Yes/No Dropdown inside of your ActiveCampaign account. Inside of Revenue Conduit's Admin Settings under the Customer Group Settings header, Revenue Conduit also automatically associates this checkbox in your Shopping Cart with this 'Accepts Marketing' Field we created inside of your ActiveCampaign account. Once we've synced customers into ActiveCampaign with this 'Yes' then you can manage their email subscription inside of ActiveCampaign using ActiveCampaign's built-in email preference and list management tools.